Balance, Strength, and Versatility - Our Tritan glasses are perfectly balanced to reduce tipping and spilling. If dropped from shoulder height onto a tile floor they will not chip, crack, or break, and they will right themselves immediately. 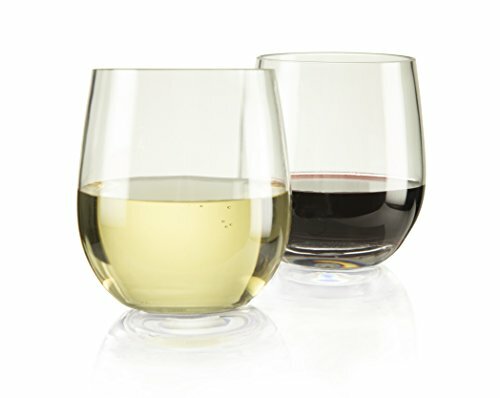 They were designed for wines, but unlike fine stemware they are also appropriate for other cocktails as well as non-alcoholic beverages. This unique combination of stability, versatility, and compact size means you can take them with you without worry to the patio, the pool, the beach, the boat, and the campsite. A New Benchmark in Durability, Elegance, and Value - These stunning glasses are truly game-changers, and are sure to become the statement pieces in your home barware collection. They are crystal clear and bear no logo-marks. Their contoured, heavy-gauge sidewalls and reinforced bases give them the look and feel of real glass, and their empty weights of 3.5 ounces each make them significantly heavier, more rigid and more durable than other unbreakable wine glasses. Virtually all competing plastic glasses have empty weights of less than 2.4 ounces. While these light-weight glasses don't break easily, they are thin-walled and flimsy, and over time they can lose their shapes, etch, cloud and discolor. By comparison, our heavy-gauge Tritan glasses are almost indestructible, guaranteed to retain their shapes, brilliance and clarity over their entire useful lives. The Perfect Size for the Perfect Pour - Each glass is 3.875" inches tall, and has diameters of 2.875" at the rim, 3.5" at the widest point, and 1.875" at the bottom, which is reinforced for added stability. The glasses' 13-ounce capacity suits them perfectly for a standard 5 ounce wine pour. TOP SHELF WINE GLASSES ARE THE CLEAR CHOICE OF WINE LOVERS EVERYWHERE, AND YOUR SATISFACTION IS ALWAYS GUARANTEED! Publisher: Top Shelf Products, Inc.
AN ELEGANT ALTERNATIVE TO GLASS - Contoured sidewalls and reinforced bases combine to a create perfect balance and a bowl profile that replicates fine glass. Crystal clear and smartly-designed, these glasses are perfect for your favorite wines and will add a stylish touch to any table. PERFECT BALANCE & WIDE, SMOOTH RIMS - Our shatterproof wine glasses are made from Eastman Chemical's Tritan TX001 plastic, proven BPA-free and food-safe. They are perfectly balanced to resist tipping and spilling, and they feature wide, smooth rims to eliminate lip irritation.